In today’s world especially, there’s no skill more important than reading. We rely on our ability to recognize and comprehend words on a daily basis; in fact, this is one of our primary means of understanding the world around us. While it’s possible to get by in the world with little to no literacy, it presents far more challenges and disadvantages to those affected. Unfortunately, there’s still a sizable amount of people who lack the ability to read. It is the job of a reading specialist to help both adults struggling with literacy and children still learning to read. However, due to the sheer importance of this job, prospective reading specialists must meet a vast spread of requirements before they can begin working professionally. 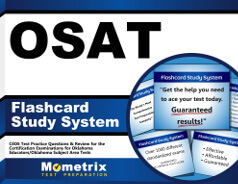 Anyone hoping to take up this career in the state of Oklahoma, specifically, will have to earn a passing score on the OSAT Reading Specialist exam. The point of this exam is to evaluate how ready you are to be a professional reading specialist, particularly in terms of academic and practical knowledge. The team at Mometrix Test Preparation understands how important this exam is to your career goals. To help, we’ve composed an OSAT Reading Specialist (015) practice test. We have designed this practice test with accuracy in mind, ensuring you the ability to gain a comprehensive glimpse of the real exam’s format. If you aren’t quite sure what to expect on exam day, this resource is the ideal way to learn. 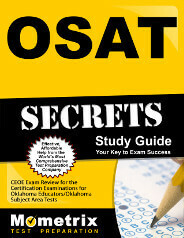 The test features 81 OSAT Reading Specialist questions in total. An essay portion takes up 15 percent of the test. It is comprised of just one “constructed-response” question, its topic being Instruction. Our OSAT Reading Specialist practice test is 100 percent free for you to use however you see fit. For best results, we recommend using it in conjunction with our companion study guide. Good luck and study hard!